Review Context: I played Civilization II a longtime ago and I’ve only played a little bit of the newer Civilization games. I have little experience in the 4X turn-based strategy genre as a whole, but I do find the genre interesting and a clear time commitment. I am always drawn and intrigued to new takes or spins on genres. Jon Shafer’s At the Gates is a game that I had no idea existed until near the end of 2018 when I discovered it existed. Upon further research, it became abundantly clear to me that At the Gates was a game that should not be ignored, as lead designer of Civilization V, Jon Shafer, was set to release his personal indie game project. It is difficult to not naturally compare At the Gates to the Civilization franchise, as they have similarities in genre, but the actually in-game experience is a lot different. 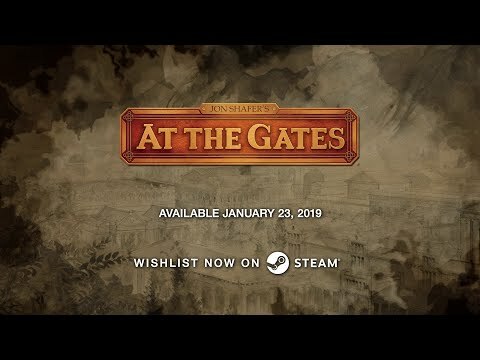 At the Gates is a rogue-like, 4X turn-based strategy experience that puts the spotlight on micromanagement of resources, an evolving economic strategy, and your ability to adapt to the conditions on your randomly generated map. The major difference in At the Gates is that you only control one settlement that you can “pack up” and move around the map, in addition to expanding its borders through various upgrades and eventually turning it into a kingdom. This key element of the game is something that I admittedly have trouble micromanaging myself (I will be better eventually, I hope), because you have to know when the right time is to move, expand, and turn your settlement into a kingdom, which gives you additional bonuses and locks you in that place permanently. The element of the game that is also different and the key to micromanagement is the “clans” system. Clans are the only units in the game you control, which you can only max out at 24, but each clan is unique. Every clan member has randomly generated traits that will shape the way you make decisions in your quest to replace the Roman empire as a dark age lord. Clan members can’t be trained from scratch, but are recruited to your tribe on a periodic basis based on your “Fame” output (resource) until you max out at 24. Each clan can learn a “Discipline” and a “Profession,” but they come with their own bonuses and problematic traits that will guide your decision making. In addition, some clans with some professions will remain in your settlement, while others will be controlled individually on the map. What makes the clans system difficult is that some clans wont get along with other clans if they are on the same tile, and/or will refuse to work in certain professions. If any clans are at odds with one another you will have to settle a dispute in your settlement, which involves picking one over the other, stripping the punished clan member of its profession and discipline, causing that clan member to be angry. I’ve had to do that more than once in my games, most of the time it is not good, but a few times I found it to be a positive. Sometimes the traits in clans are mostly positive, but you will usually be juggling positives and negatives. Although you don’t train new units from scratch, you do train professions and disciplines for clans, as well as studying new professions. These do take turns, with certain clan members’ traits affecting the number of turns studying a specific profession may take. There are many professions to study in the tree to learn for your clan using “Knowledge” (resource), with some professions seeming like they could be combined or tweaked. Part of the micromanagement in the game is picking the professions and eventually choosing the right time to re-train to a different one. As alluded to above, while you will be guided in choosing the professions for your clans based on their traits, whatever the map layout is also guides that decision. For example, if you begin in a wooded area, you might want to focus your clans on being woodcutters or loggers. Likewise, if you begin in an area with lots of food resources, you might want to begin with reapers, harvesters, or farmers. The great beauty of At the Gates is that every game will likely cause you to play different. But what if you are strapped on certain resources? That is taken care of with the caravan that comes by periodically, which you can use treasure to buy resources or sell your own resources, but not every resource may be available to purchase every caravan visit. The caravan system prevents the game from being a resource disaster, because you can stack and sell resources you have large quantities of and buy resources you are missing to help make up for holes in your economic strategy. That isn’t to say the caravan system is a perfect safety net, as I am now far in a playthrough where I am gutted on iron and starting to feel the effects of not having iron (or steel) near me as a logjam in my playthrough because I can’t advance far into the endgame without it. The game does feel very iron dependent, due to needing lots of tools and weapons created from iron to advance further. 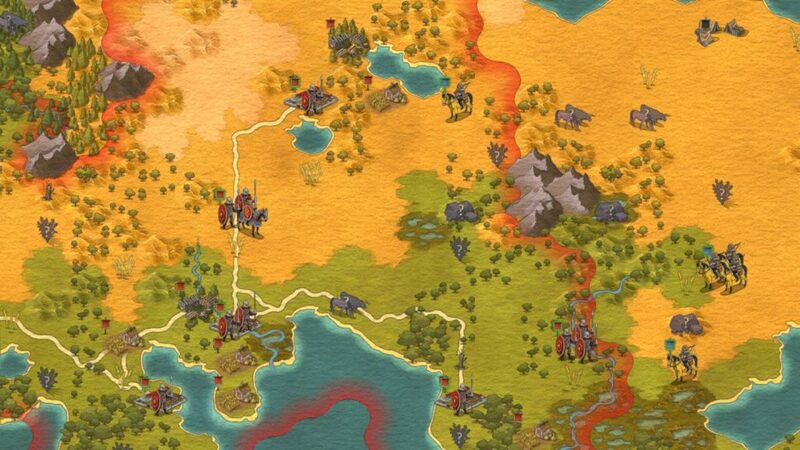 As you begin exploring the map during your playthrough, you may encounter other tribes. At the start of the game you can only play as the The Goths, but as you engage other tribes through diplomacy or force, you will unlock other tribes you can start with in future playthroughs. Each tribe has its own starting resources and benefits, giving further replay value to the game. I have personally only unlocked one other tribe, but I attribute that to my slow play. I expect other more experienced players of the genre to unlock tribes quicker. The diplomacy system in At the Gates is a work in progress, but you may receive offers from other tribes threatening you or offering an alliance, displaying pluses and minuses for each decision. I unlocked my one tribe (The Franks) through an alliance. The diplomacy system seems to be mostly one-sided via the menu, giving you few options. Hopefully this is tweaked for the better in future patches. My one big gripe with encountering tribes on the map is the color doesn’t have a tooltip for what tribe it is. It is possible to figure out through gameplay, but it’s a glaring omission that needs to be put in the game. The game’s weather mechanics are also a major part of the game, as you need to pay attention to the months, because you are limited to what you can do by the weather conditions of the tiles. 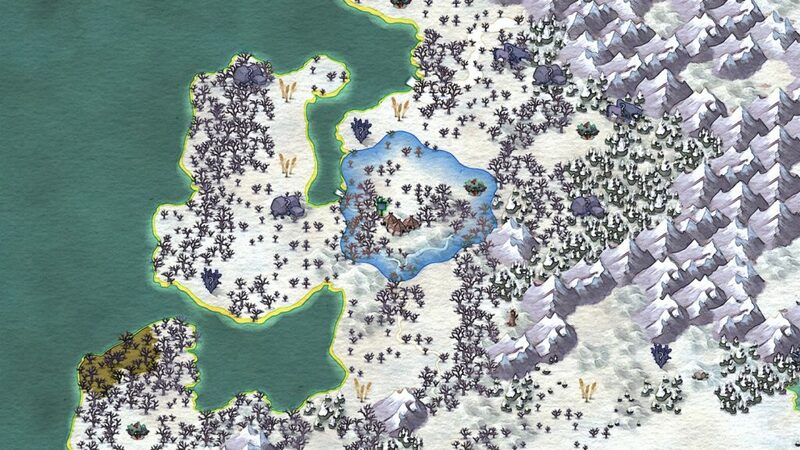 Winter is a tough season to get through, so managing your clans’ movement in or outside your borders and saving resources accordingly is paramount to your survival. Once you’ve been through a full year in the game in the various weather conditions you will have seen most of the graphics, which to me is very beautifully done and adds a certain element to the game that gives the game its charm. 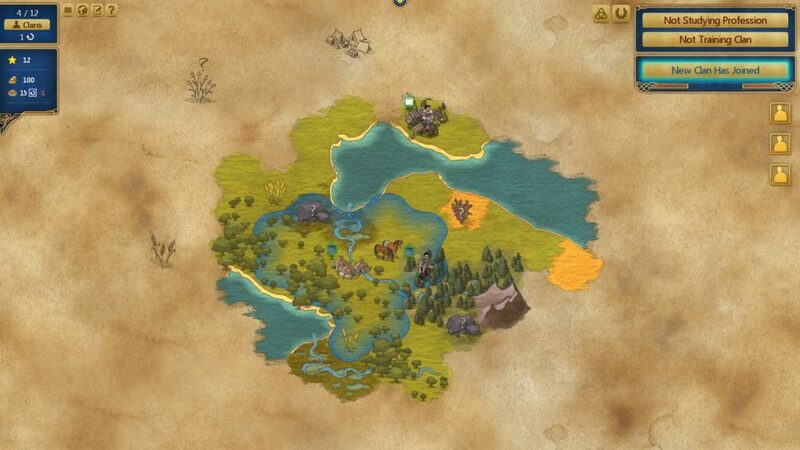 During your exploration and likely when you start a game, you will see unidentified resources and unexplored territory outside your borders in a nicely drawn sketch that gets colored once explored. Animations are also shown of your clans performing their various professions in the game, which really helps to make actions in your tribe vibrant and come to life. The sounds and soundtrack in the game are also good enough to add to the in-game experience, but certainly not a highlight. As someone who hasn’t spent many hours in the 4X genre, but has played Civilization games before, I found At the Gates to be easy to pick up without a tutorial (expected to be added), especially after my first disaster of a game of learning the nuances of the mechanics. The in-game help menu is very useful, as well as the many tooltips in the game, to help you learn what each action or structure does. In a game like this, the user interface is going to be a major issue, but I personally found the screen layout to be mostly clean, with exception to your resources window being possibly covered at the bottom left during caravans and viewing your settlement options. The professions learning screen has upgrades stack and hidden, which can clearly be presented better, in addition to the toggles on clans for actions/upgrades using resources. There is no mini-map in the game, which I am somewhat indifferent about, given how easy and quick it is to zoom out and move your mouse around the map. It is also not that easy to keep track of all your clans, as there is no clan chart window or anything like that. Where the UI does shine is the presentation of learning professions and training professions on the right side of the screen, in addition to the in-game events that pop up below it. That side of the screen can be an easy guide of what to do next in a turn, but it doesn’t need to be followed. For me personally, I would like to see more video options added. Jon Shafer’s At the Gates is certainly not a completely finished product, as tweaks (AI, pathing) and balances still need to be made, but the game is still playable and addicting. As someone who has minimal Civilization experience in the last ten years and 4X genre experience as a whole, I am still enjoying it and will continue to play it. The flaws that need to be fixed and features that need to be added don’t prevent me from continuing my enjoyment and exploration. The other night I was completely sucked into the game and completely lost track of time due to how engaged I was in the game. At the Gates has plenty replay value, as the quantity of professions and map variety in this rogue-like experience wont necessarily mean you train every profession every game. There are a lot of intertwined elements of how professions and resources interact with each other that I am still learning, but the core game mechanics don’t seem complex at all to me as a non-4X player. My enjoyment with At the Gates is discovering new land, seeing how things work, and as I play more, naturally trying out new strategies as the map dictates. I will continue to play this throughout 2019, and I look forward to the promised updates from Jon Shafer.